Fall in New York | Cheer Up! It’s that time of the year again. The crisp cool scent in the air. The reds, oranges and yellows of the leaves. Fall in the north-east is a gift, as if Nature dipped her paintbrush into a golden palette and painted the hills and valleys especially for you. Fall is late in the city this year. Halloween is almost here, and the trees in Central Park have just started changing colors. Apparently, we can blame global warming — specifically, an unseasonably warm September, for this delay. However bad this is in the long run, what it means for New Yorkers is that we get to enjoy a longer fall season this year. The city may just be getting started, but the rest of New York state is at or past peak. Of course, most of us living in NYC do not have a car to take us on one of those delightful fall drives. (Sign up for Zipcar. Or, if you don’t have a license, date someone who does. Maybe someone in Jersey or Long Island. Come on, some days you just need your own wheels!) The good news for this weekend is that the peak fall foliage is in the Hudson Valley, easily accessible by train from NYC. Trains for Poughkeepsie leave Grand Central station every hour. It is a lovely train ride, following the right bank of the Hudson the whole way. You can see the colorful trees reflected in the water from the Palisades to the Catskills. 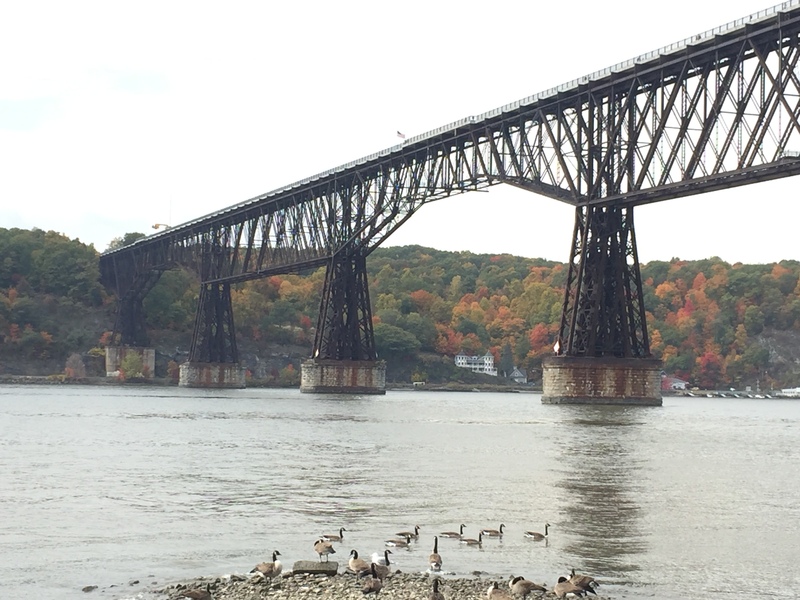 If you take the two-hour ride to the end of the line, you can access the Walkway Over the Hudson, the longest pedestrian bridge in the country. It makes for a delightful afternoon walk, specially if you had the foresight to bring sandwiches to enjoy with the view. Head out there, and add a little color to your weekend! What is your favorite thing to do in fall? Let me know in a comment below. 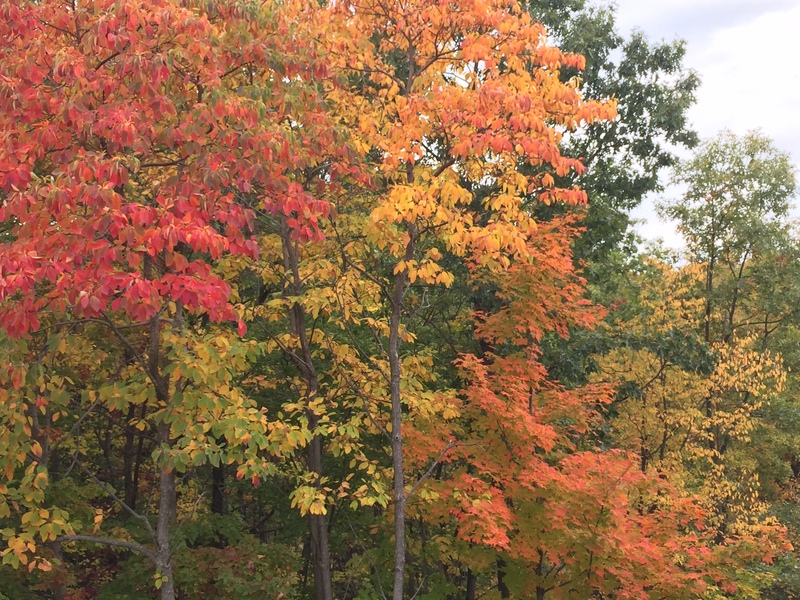 This entry was posted in Fun in the City and tagged Fall, Fall colors, Fall foliage, Hudson, New York, NYC, Therapy. Bookmark the permalink. Can I take that as a promise that I will enjoy the travel from JFK to Jersey City this Sunday evening? I know it is better to go north from NYC for the best fall colours, but hopefully across the river and south is OK too. I guess my favourite thing to do in the Fall, judging by my plans, is to spend all day indoors in meetings! But I do plan to walk to and from the meetings to my hotel (Hoboken to Jesery City), through areas that hopefully will have at least some fall foliage, even if sprinkled among masses of concrete. Hiking in the Catskills would certainly be a favourite thing to do, did that once twenty years ago – with a good friend who gifted me a picture to prove that we, too, did such things together. Wish you the best, Curt McKelvey, wherever you may be these days! So, did you enjoy your trip from JFK to Jersey City? Save yourself some daylight to go out for a walk before/after you sit in meetings indoors! I did actually, parts of the journey were beautiful with the night lights and riverview, though 9pm was not ideal for fall colours. Other parts we got to enjoy the pleasures of barreling along a well-lit tunnel. I still love playing in leaf piles! Well said. I plan to write a future blog post on this, called “The Pause”. We don’t even notice what we’re missing in our busy lives – the small beauties in daily moments.